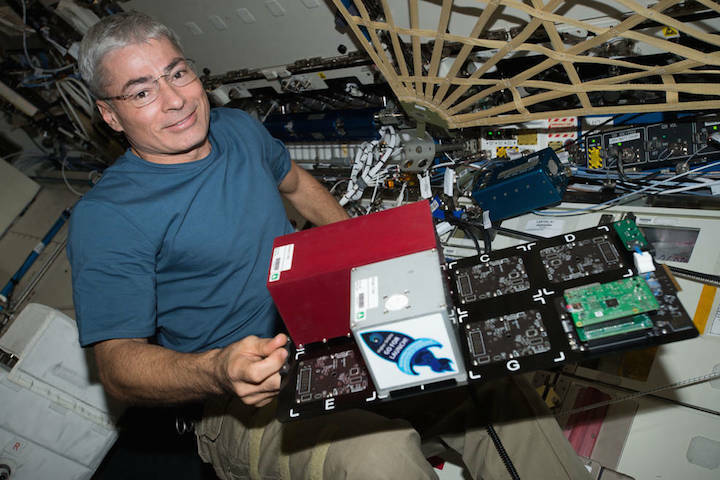 Flight Engineer Mark Vande Hei swaps out a payload card from the TangoLab-1 facility and places into the TangoLab-2 facility of the International Space Station. TangoLab provides a standardized platform and open architecture for experimental modules called CubeLabs. CubeLab modules may be developed for use in 3-dimensional tissue and cell cultures. Primary school students in Indianapolis will speak live with astronauts living and working on the International Space Station at 12:15 p.m. EST Thursday, Jan. 11. The 20-minute, Earth-to-space call will air live on NASA Television and the agency’s website. Expedition 54 astronauts Mark Vande Hei of NASA and Norishige Kanai of the Japan Aerospace Exploration Agency will talk to approximately 300 students and 30 teachers gathered at The Children’s Museum of Indianapolis. The students and teachers have been preparing for the event by studying the space station, astronaut biographies, and current research and activities aboard the space station. Media interested in attending the event should contact Becky Wolfe at 317-334-4618 or beckyw@childrensmuseum.org. The Children’s Museum is located at 3000 North Meridian Street. Linking students directly to astronauts aboard the space station provides unique, authentic experiences designed to enhance learning, performance and interest in science, technology, engineering and math. This in-flight education downlink is an integral component of NASA’s Year of Education on Station which provides extensive space station-related resources and opportunities to students and educators.